Broadleaf has extensive experience of both public and private sector ICT projects and operations. Risk management first took hold as a discipline in the sectors facing the greatest challenges, with Defence and ICT being at the forefront. Several of our senior personnel trace their careers back to information and communications technology or have spent a significant amount of time dealing with risk management in this sector. Broadleaf has provided risk management support for ICT projects in Australia and New Zealand. We also provide specialist services in ICT procurements through tender risk adjustment and liability assessment, as well as market testing the procurement of support services and other projects associated with ICT. Tender risk adjustment enables the comparison of alternative bids with different prima facie technical and commercial offerings and headline prices. This allows a rational comparison of low cost offers with limited capability against higher cost bids with high grade expertise, where both may appear acceptable but implementation is expected to play out differently depending on the one that is selected. 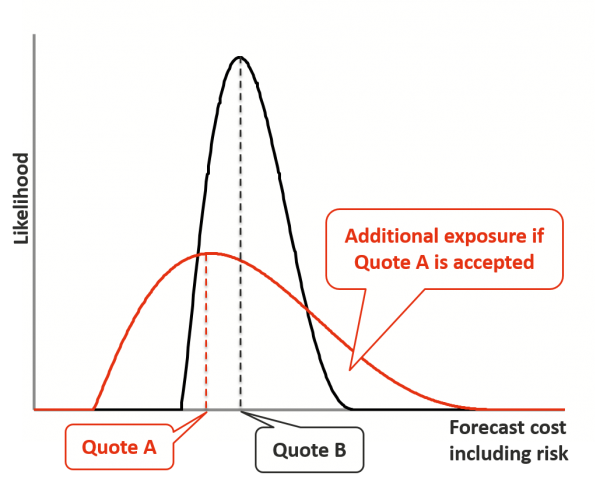 This is illustrated in Figure 1, where the quotation with the lower price has a good chance of being more expensive than the higher price quote will event be even if its costs rise. Liability assessment supports procurement teams who are negotiating acceptable liability conditions with suppliers. It overcomes the historical insistence on unlimited contractor liability, which generally favours large suppliers and limits the ability of smaller firms to compete in the market. 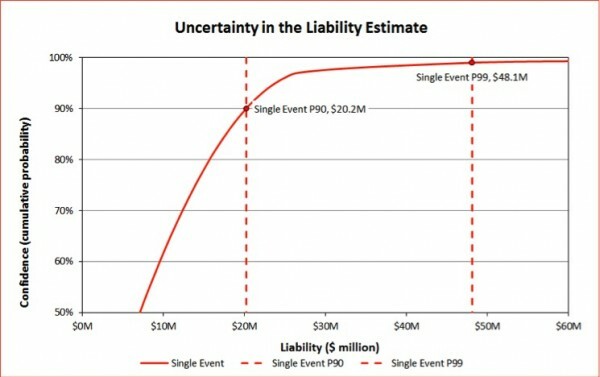 A risk-based assessment of liability reduces the cost of contracts by avoiding paying a premium to cover the contractor’s exposure to unlimited liability and insurances associated with this position. It can open competition to a wider range of suppliers and take advantage of small and medium sized local suppliers. A characteristic output from a liability assessment is shown in Figure 2. Risk management makes a strong contribution to any complex project. The complexity and volatility of ICT projects means that they often face greater challenges than other projects, so they can benefit greatly from the application of formal risk management techniques. Risk management brings improved information, more realistic plans and better communication about an uncertain future. It is also an effective means of bringing potentially adversarial groups, such as project sponsors and funding delegates, to a mutually acceptable view of the best way forward. We also engage in a range of activities involving high-technology systems engineering and systems integration, particularly in the defence sector. This includes risk assessments and the development of risk management strategies for large, complex high-technology projects. We conducted quantitative risk assessments to determine appropriate limits of supplier liability for the four business-oriented contracts. We conducted quantitative risk assessments with Defence and Air Services to determine appropriate limits of supplier liability for the acquisition and support contracts. We carried out a quantitative analysis of the expected cost to the business of systems interruptions, the temporary measures that would be required until the system was reinstated and the cost of reconciling and updating business information after an event. This was used to drive business continuity planning and assess the need for a hot standby site, which was found to be unnecessary. We facilitated a qualitative risk assessment for the maintenance of fixed lines to households not affected by the National Broadband Network rollout. We provided risk management services to the program, including facilitating risk assessments, managing the PMO risk management processes, updating and maintaining project risk registers; we conducted quantitative risk assessments to determine appropriate limits of supplier liability for the ICT contracts associated with the reform. We conducted quantitative risk assessments to determine appropriate limits of supplier liability for the four main ICT contracts. We provided risk management services to the project, including facilitating risk assessments, managing the project risk management processes, updating and maintaining project risk registers, RFT development and tender evaluation on matters relating to risk management. We conducted quantitative risk assessments to determine appropriate limits of supplier liability for the two communications contracts. We conducted quantitative risk assessments with project stakeholders to determine appropriate limits of supplier liability to be applied to the new Defence Central Processing contract. We conducted quantitative risk assessments with project stakeholders to determine appropriate limits of supplier liability to be applied to a major contract variation. We conducted quantitative risk assessments with 12 agency stakeholders to determine appropriate limits of supplier liability for the Gateway contracts. We conducted quantitative risk assessments to determine appropriate limits of supplier liability for the contracts. We conducted quantitative risk assessments to determine appropriate limits of supplier liability for the EDW contracts. We developed and delivered a one-day training course to ICT small and medium enterprises (SMEs) on basics of risk management and risk management in tendering for government ICT business. We carried out quantitative risk analyses of the costs of the Passport Redevelopment project, the Passport Personalisation project, the Financial Application Service Transformation project and the Emergency Management Information System project. We carried out quantitative risk analyses of the Ultrafast Broadband in Schools project’s costs and benefits, the National Education Network project’s costs, the Payroll project’s cost of delays, and the Early Learning Information System project’s costs. We carried out quantitative risk analyses of the costs of the Disaster Recovery project, the Segmentation project, and the Electronic Operating Model project, and we facilitated a qualitative risk workshop and analysis of the Family Justice Implementation Programme’s ICT project risks. We carried out a quantitative risk analysis of the costs of the Human Resources Management Information System project. We used quantitative risk modelling of the cost of implementing a new student record system across 13 TAFEs to compare alternative tenders and select a preferred procurement model. Later we used qualitative risk assessment and quantitative risk analysis to support decision-making during project implementation. We conducted quantitative risk assessments to determine appropriate limits of supplier liability for the SBR contracts. We used qualitative risk assessment and quantitative risk modelling to support the preparation of a business case for the replacement of an old system used to manage the issue and control of drivers’ and other licences, leading up to the project being approved. Later, we carried out tender risk assessments and prepared risk adjusted tender price forecasts to assist in tender selection. We conducted quantitative risk assessments to determine appropriate limits of supplier liability for the FIC contract. We evaluated the likely financial consequences of over fifty tenders for mobile, fixed line and data service provision to the Victorian Government, taking account of the options to accept multiple services from the same or different suppliers. This analysis was used to support tender selection and price negotiation. This case study describes a range analysis of the cost of two options for the acquisition and implementation of an asset management and maintenance system for a utility business, under an agile delivery approach. It demonstrates a straightforward quantitative approach to comparing options that generated far more insight than could be obtained from a simple comparison of the initial quotes from software vendors. This case describes a business risk analysis and planning exercise for a ship chartering company (CharterCo) and its in-house IT team to consider the Cargo Plus Project. It describes a relatively simple process that clarified everyone’s understanding of the project and its objectives, identified key risks, and helped the project team set priorities for the next phases of the work. Broadleaf conducted a review of the implementation program for payroll systems in a group of six related service-delivery networks. Simple Excel structures were used to model the schedule and the uncertainty associated with it. The outcomes provided a structure for activity and manpower planning, as well as a basis for liaison and coordination between the implementation company and the networks. This case describes the estimation of a risk-based liability cap for a high-value, complex procurement contract. An estimate of potential liabilities, based on scenarios that might arise and their implications, provided a sound basis for negotiating liability terms in the contract.